Arthur Conan Doyle was born in Edinburgh, Scotland on May 22, 1859, one of seven surviving children of Charles and Mary Doyle. He attended Jesuit school from the time he was nine until reaching the age of 16, after which Arthur studied medicine at Edinburgh University for six years. It was during this time that he studied under Dr. Joseph Bell, whose amazing deductive powers and accuracy in determining information about his patients impressed Arthur. However, his studies ended and Arthur was off to serve as a ship's doctor to and from the African coast. Doyle settled in Southsea and set up his practice shortly thereafter. Although his medical practice grew, there were many slow times that Arthur filled writing ideas for stories. He had read much detective fiction over the years and was often disappointed in the way the stories were resolved. He felt he could do better, so using Dr. Bell's inspiration and lining up dozens of intriguing, deductive points, Arthur set off to write his first novel, A Study in Scarlet, starring a detective named after an old cricket friend from school and a much admired Oliver Wendell Holmes and who possessed tremendous deductive powers. It took a while for it to be accepted, but in 1887, two years after Doyle married the sister of one of his patients, 'Touie' Hawkins, Beeton's Christmas Annual published the novel, paying Doyle all of £25. Following this, Doyle wrote his historical novel, Micah Clarke, which appeared in print in 1889, then another Sherlock Holmes novel, The Sign of Four for Lippincott's Monthly Magazine that same year. It was two years after the publishing of his second Sherlock Holmes adventure that a monthly periodical called The Strand Magazine opened its doors. Doyle arranged with the publisher to provide a series of short stories featuring the detective and his faithful friend both to guarantee an income as well as increase the circulation of this new venture. 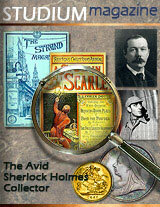 In July of 1891, Doyle's A Scandal in Bohemia was published followed closely by 11 other stories which became known in the collected hardback as The Adventures of Sherlock Holmes. Doyle was then pressed to complete another 11 stories, and reluctantly complied. Doyle was growing bored with the series, and began to despise the fact that his more serious pursuit of writing better works was being held back by this 'growth' upon him that dominated his time. He decided that the final solution would be to kill good Sherlock off in the last installment to be known as "The Final Problem". This then would leave Doyle the peace he anticipated to further his serious literature and spend time with his ailing wife. The public was horrified, with many avid readers wearing black arm bands in mourning the death of Holmes. Doyle received angry correspondence, which for now did not deter him from his drive to end this page in his life and turn another. Doyle published some of his other works during what would become a respite from the detective, including his well-received Rodney Stone and Uncle Bernac. He visited Egypt, became a war correspondent in Africa and subsequently served unofficially as a supervising doctor in the Boer War. It was for his writings related to the Boer War that Doyle received a knighthood in 1902. During this time, however, Doyle came to understand the vast popularity of Sherlock Holmes, and decided to create a novel featuring the detective that took place prior to his fall at Reichenbach. This novel, The Hound of the Baskervilles was received by a hungry public who stood in long lines to obtain each of the nine installments published in the Strand Magazine from August, 1901 to April of 1902. Recognizing the overwhelming popularity of the character of Holmes, the American Collier's magazine offered Doyle the record sum of $45,000 to create thirteen stories featuring the detective. Doyle could not say no, and resurrected Holmes in The Empty House in the fall of 1903. Thirteen were indeed completed, known collectively as The Return of Sherlock Holmes, followed by an additional eight beginning with Wisteria Lodge in 1908. It was during this time that Doyle's wife, Touie was declining in health and nearing death. Doyle began courting another woman, Jean Leckie, which had Doyle facing much consternation from the public at large. Nevertheless, Touie passed away in 1906, and Doyle married Jean the following year. Doyle then wrote his famous work, The Lost World which was serialized in the Strand beginning in 1912, followed by the fourth and last of his Sherlock Holmes long novels, The Valley of Fear appearing two years later. At this point, Doyle felt through his experiences in war and death that the spirit of the dead must be able to communicate, and began embracing Spiritualism, deciding to devote his remaining years to its advancement. In July of 1917, a photograph of a small girl surrounded by tiny fairies helped to convince Doyle that indeed spirits in different forms exist and visit those who call upon them. He thoroughly explored seances and spoke frequently about his beliefs, much to the chagrin of a doubtful public. A final run of Sherlock Holmes stories beginning with the Mazarin Stone appeared in 1921, but his enthusiasm had long ago waned for this literary pursuit. His final story, Shoscombe Old Place was released in the Strand in April of 1927, ending a total of 56 short stories and four novels that enamoured a public famished for the intelligent and observant. On July 7, 1930, after suffering a heart attack on his return from a tour of Scandanavia, Sir Arthur Conan Doyle died at his home. Whether spirits come back to us and visit or not, Doyle, for his varied literary works, particularly the retired consulting detective now keeping bees, shall live forever in the hearts of future generations who will be visiting him at the door marked 221B Baker Street.